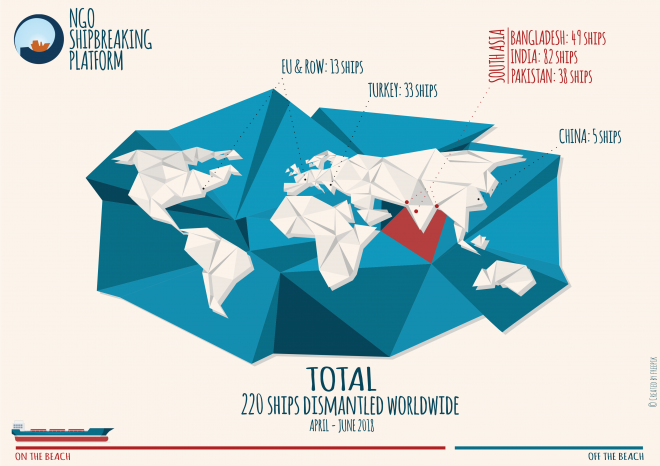 In its recently published figures for the second quarter of 2018, NGO Shipbreaking Platform informed that a total of 220 ships were dismantled, 169 of which were sold to South Asian shipbreaking yards for 'dirty and dangerous breaking'. Also in this period, the Platform recorded a total of 8 deaths and 9 injuries in these yards, including six deaths and seven injuries in Chittagong alone. In India, one accident was reported in Alang, which cost the life of a worker: On 13 April, Ravindra Chaudhari, who was working in Plot 2, was hit by a falling steel plate and died. 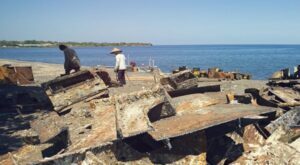 Plot 2, which has applied to be on the EU List of approved ship recycling facilities, and was one of the first yards in Alang to receive a so-called Statement of Compliance with the Hong Kong Convention by ClassNK, is the main yard of Leela Ship Recycling Pvt. Ltd.
Apart from this incident, little is known about accident records in Alang as no information is made publicly available. 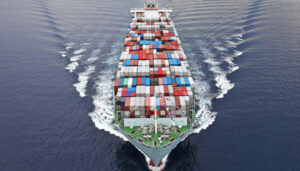 American ship owners sold the most ships to the South Asian yards with 26 vessels beached, followed by Greek and UAE owners. American company Tidewater was the biggest dumper with 15 vessels beached. In the end of April, Pakistan re-opened the market to the import of tankers. 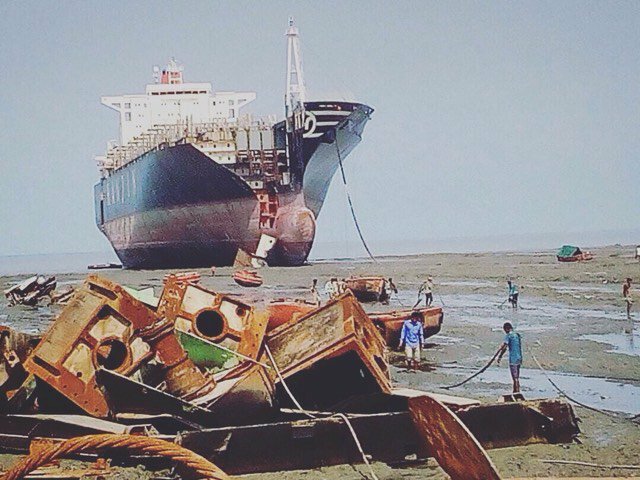 In two months alone, 22 tankers reached the shores of Gadani to be scrapped. Industry sources report that devaluing freight rates have contributed to the demolition of over 100 tankers in the first half of 2018. Only three ships had a European flag – Greece, Malta and Norway – when they were beached last quarter. 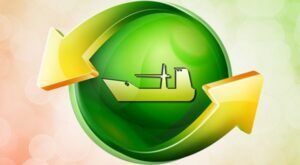 According to data provided by the Platform, all ships sold to the Chittagong, Alang and Gadani yards pass via the hands of scrap-dealers, also known as cash-buyers, that often re-register and re-flag the vessel on its final voyage. Grey- and black-listed flags of convenience are particularly popular with cash-buyers, and more than half of the ships sold to South Asia this quarter changed flag to the registries of Comoros, Niue, Palau and St. Kitts and Nevis just weeks before hitting the beach. This is the highest number of flag changes recorded by the NGO Shipbreaking Platform and raises serious concerns with regards to the effectiveness of legislation based on flag state jurisdiction. These flags are not typically used during the operational life of ships and offer ‘last voyage registration’ discounts. They are grey- and black-listed due to their poor implementation of international maritime law. 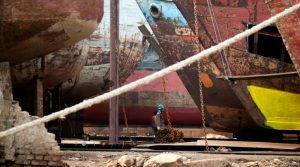 Although Bangladeshi ship recycling yards are at the centre of global criticism for dangerous and pollutant working practices, the yard PHP Family announced last week it would start demolition of its first vessel in accordance with Hong Kong Convention standards. The shipyard, located in Chittagong, was the first in Bangladesh to win a statement of compliance with the Convention, back in October 2017.